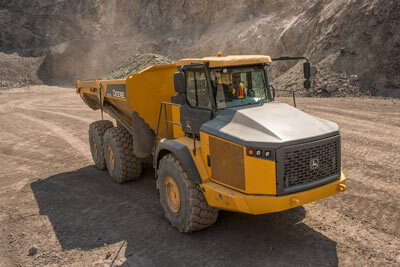 Bolstered with big updates, the new 370E, 410E and 460E articulated dump truck (ADTs) are designed to keep materials moving and profits flowing. The three models are highlighted by an EPA Final Tier 4 (FT4)/EU Stage IV John Deere PowerTech diesel engine and a pressurized Deere-designed cab – both of which combine to boost productivity and uptime, while minimizing daily operating costs. Perhaps the biggest change to these new models is the updated cab. 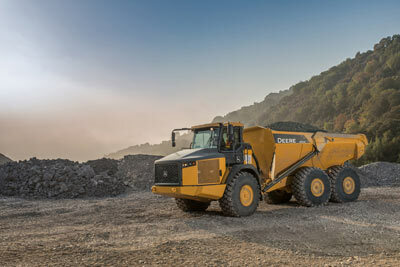 The ultra-quiet, redesigned cab is sealed and pressurized to keep out dust and noise, affording enhanced operator concentration and efficiency. Creature comforts include push-button start, low-effort push-button controls, air-suspension heated high-back seat, tilt/telescoping steering wheel and optional premium radio with Bluetooth, auxiliary input and satellite radio capability. Stairway lights can be turned on with the push of a button from ground level for easier visibility when entering the larger cab entryway. An integrated tire-pressure/temperature monitoring system comes standard to help maximize tire life and fuel efficiency. If pressure drops by 10 percent, a passive alarm appears on the monitor. In addition, further pressure decreases or overheating result in an audible warning and an email alert that is sent via JDLink. A favoured customer-driven feature of the E-Series and a hallmark for John Deere is centralized, true ground-level servicing to simplify daily maintenance and overall serviceability. All daily service can be completed from the ground. Hydraulically controlled fans with swing-out cooling packages on both sides of the engine highlight the cool-on-demand system. For dusty environments, there is a reversible fan option available for simplified cooler cleanout. Operators looking to get the most out of their E-Series can rely on Ultimate Uptime featuring John Deere WorkSight. 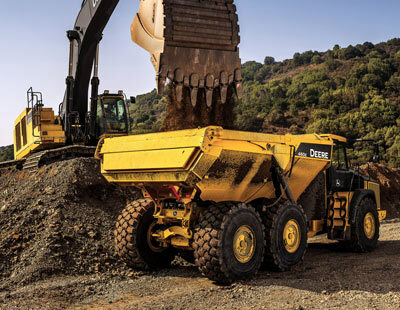 With Ultimate Uptime, operators receive predelivery and follow-up inspections; three years of JDLink™ telematics, machine heath prognostics and remote diagnostics and programming capability; and the ability to add additional dealer-provided uptime solutions to customize the package to individual needs.